Coupon: Check out all the free gift with purchase coupons. Or coupon code TAKE15 or FIRST15 to save 15%! The Products: Feel good and purposeful products free of parabens, phthalates, sulfates, and petrochemicals. Each box comes with a card detailing all the items included. Birchbox consistently delivers some of the most incredible limited edition beauty, skincare, and makeup boxes I have ever reviewed in terms of curation and value. I am so excited to get into the products in this box. This and the following products are a bit of a blast from the past! I remember this was one of my first “expensive” makeup purchases back years and years ago, though I think I bought the ‘Peony’ shade if memory serves. I loved it for the cute compact which made me feel incredibly fancy, and the fact that I could use it on both my lips and cheeks made me feel very chic and helped justify the cost, which at that time felt like a lot for a kid with a summer job! if only I knew how expensive serums and oils would be! I still love this stuff, though I haven’t bought it in years. Getting it in this box kind of reawakened my warm and fuzzy feelings for it because it feels like such a summer product and it is getting warm! The sheer pink is perfect for both lips and cheeks (no small feat!) and they light texture works so well with naked skin or your fae BB or CC cream. I still adore the floral compact too. I feel like I am time traveling. Benefit Dandelion was and still is one of my favorite blush options out there, especially for fair skin like mine. I remember I had a friend in college who worked at the local Macy’s Benefit counter and she got me a full-size box as a gift. It has been a sweet romance ever since. We almost broke up when Benefit decided to shrink the amount of product in each cute little box, but we made it through. This is is the original Dandelion’s shimmering sister, and though she could never take the place of my original, she is a great addition to my kit. This powder isn’t quite as pink as the original, but there is some warm blushy glow there, and this formula is much more shimmery, but in a very wearable way. It is a great highlighter for someone who prefers a shimmer to glitter, and you will love the fresh peachy glow too! I like Kiehl’s products because the ingredients are great, and the packaging is no frills but packed with very clear ingredient info. Kiehl’s was actually one of the first companies to openly list their ingredients, even before it was required by law. This face wash is very gentle and has a slightly floral, herbal scent. The foaming action gets into your pores and gets all that gross day dirt and makeup off easily. Though this is a travel size, there is a ton of product here that should last quite some time. 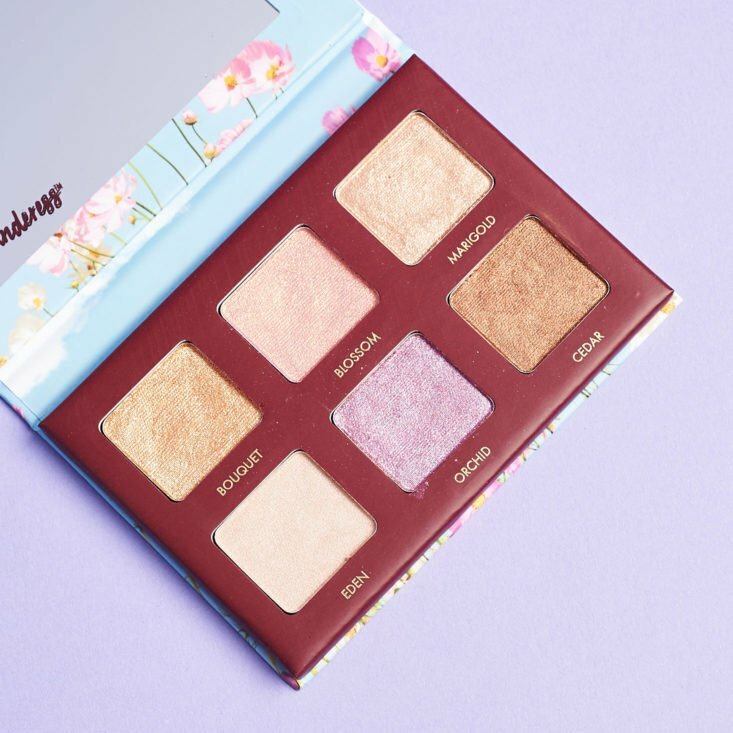 Eyeshadows inspired by flowers and plants? This just screams spring. Sign me up! This pretty palette looks much more full of shimmer in the pots than on skin, though I think it might have benefitted from one or two matte shades. The colors are fresh and super feminine, and even the purple is very wearable. Pigment payoff is great ad they blend like a dream. Each can be worn very subtle with a light application, or pack them on thick for some petal inspired drama. I adore Herbivore. Something about their minimal packaging and high-quality formulas speaks to me. This oil is a dream with its lightweight feel and sweet jasmine scent. It is perfect for your legs, arms, elbows, and knees if they need a little moisture. This blend of camellia flower, grapeseed, and jasmine oils absorbs really quickly, so even if you don’t think you like oils, give this one a try because its non-greasy finish might surprise you! You can also use this on the ends of your hair for a little scent and smoothing. I love it for calming my flyaways! I am an oil addict, so I was so excited to see a face oil included in this box. This matte black bottle is so chic too! This floral scented blend of Macadamia Nut Oil and rose extract is lightweight and a fast absorber. This oil helps restore your skin’s lipid (natural fat) balance, meaning more radiant skin, improved texture, and dewiness. If you are someone who loves going sans foundations in the summer, try mixing a tiny bit of your favorite highlighter power with this before applying it on your face and enjoy a radiant glow. Oils, Oils, Oils. I am in heaven. This nourishing rose cleansing oil is very fresh and effective. t is also a great cleanser if you are traveling or camping and have less access to fresh water than you would like. Simply apply a small amount to your skin and rub in, then wipe away with a dry or damp cloth. It will do a great job of removing all of your dirt and makeup without stripping your skin. You can also use this as the first step in a double cleanse, just apply it to your dry skin then wash away with warm water in the sink or shower. Follow up with your favorite second cleanser if needed! This light eye cream is full of peptides that help your skin retain moisture and stay plump! They also can help with hyperpigmentation over time. A little goes a long way with this product, so I appreciated the precision dispensing nozzle since it helps me waste less product. I dapped this under my eyes before my nightly moisturizer and my delicate undereye skin looked really hydrated in the morning. Ironically, this free bonus was the only thing in this box that I wasn’t crazy about. The candle itself is lovely and burns evenly and cleanly. The scent was one I couldn’t decide if I loved or disliked because it was barely noticeable then randomly it would be super sharp in my nose in an unpleasant way. It has notes of currant, apple, rhubarb, and tulip. I ended up blowing it out after about an hour. Verdict: This Birchbox Limited Edition ‘In Bloom Box’ has an estimated value of about $236.84, which is excellent for a $52 investment! I am a flower and oil addict, so this assortment felt like it was curated just for me. I loved getting two variants of two products I already knew and love. The convertible color compact and Dandelion highlighter haven’t left my purse yet! I was in oil heaven with the trip of body oil, face oil, and cleansing oil, all in alluring floral scents and formulas. The face wash left my face feeling so fresh, and since I double-cleanse, I can never have enough high-quality facewash. I also am a sucker for a good eye cream, and this box delivered a full-size bottle from a brand I am not very familiar with, but have heard good things about. The eyeshadow palette was really on-theme and very pretty, though I will use it with a light hand since the colors are very shimmery. Lastly was the candle that I didn’t really like, but I am not one to complain long about a bonus item. This box would make an incredible #treatyourself purchase, or get one for your mom for Mother’s Day! Can you still get this box today? Yes, as of publication, this limited edition box is still available for purchase! Alternatively, each of the 9 items has an average cost of 5.78. Check out all of our Birchbox reviews and our other favorite beauty box subscriptions! What do you think of the Birchbox Limited ‘In Bloom’ Beauty Box? I absolutely LOVE this box. I forgot I ordered it and received a few days ago. I love everything in it even the candle! I almost want to get a 2nd box for backups! Birchbox doesn’t ship to Canada and they haven’t for years. I actually totally forgot I grabbed this up awhile ago. Had to check my account for tracking and was nicely surprised that it is out for delivery today. I’m super bad with over products, but can still never turn down a great deal. Looking forward to this today and your review is absolutely fabulous and makes me look forward to it even more. Yay! Any new fave products? Love this box. I grabbed it the first day it came out. I primarily wanted the Derma E cleanser and Babor face oil. The cost of those two full size items alone are more than the cost of the box. The candle and eyeshadow palette will become birthday/holiday gifts. I am an oil freak, so I am now obsessed with both the Babor and Herbivore, but I especially love the jasmine oil because you can also use it in your hair (I recommend just the ends) and the smell is heaven. I got this box a while ago and I absolutely love it! No regrets whatsoever!!!! That’s a mini benefit dandelion highlighter. I want this box so bad! I think the value is great. Megan, I just love your reviews! Your voice really shines through and I love how you give us little tips throughout. You really made me want to go get this box! Me too! But the size of the products is still great, this box is better than the feel unique clean beauty one. They do sometimes go on sale. Depends if you want to risk it selling out before they go on sale or not.